On a raised stage elevated two or three meters above the floor of the concert chamber of Auckland’s Town Hall a narrator’s voice introduces the dance theatre production Māui – the latest offering from Fresh Movement, a dance company that brings together hip hop, contemporary dance, and Māori and Pacific movement to create hybrid forms of expression that speak to the reality of modern-day Aotearoa. The production is directed by impressively talented Hadleigh Pouesi, one of the creative team behind the Freshmans Dance Crew who represented New Zealand at the Hip-Hop International World Championships in Las Vegas in 2014. Choreographed by Pouesi and Christopher Ofanoa, with music by Tony O’Rourke & Gibson Harris, and presented by Auckland Live, the production is a retelling of Maui’s legend and stories using the language of dance, projected film sequences and graphic illustrations. Reverberating off the concert chamber walls, the performance begins in darkness with the narrator situating the production as part of a journey that started with the early Polynesian ancestors over 5,000 years ago: ‘We are tangata whenua. We are Polynesian. We are Pacific’ – the voice intones. The light fades up on three figures standing on the stage who begin a stylised powhiri or welcome ceremony for the audience. Stage left is a Maori warrior who begins dancing a wero or challenge. Stage left is a Chiefly character, perhaps a Samoan Matai, who recites a karanga or call of welcome. Centre stage is a young dancer dressed in everyday clothes. The warrior places a small wreath of leaves at the feet of the young contemporary dancer as a peace offering. He picks up the offering and a moment later the bodies of perhaps two dozen dancers flood the stage. Against a back projection of a moonlit ocean, and to the sound of rolling waves, the bodies walk in procession ingeniously creating the movement of waves, gently rolling in-turn from left to right and allowing the crest of movement to be passed on to the next line of bodies until the motion reaches the end of the stage and begins to return again. It is a simple but remarkable moment, beautifully conceived and delicately enacted by the cast. In this way the production begins with the fluidity of water, recalling the connection to the Pacific Ocean and the migratory journey of the ancestors that made Aotearoa home. The performance is organised into a series of chapters or dance sequences exploring an aspect of Māui’s story. It begins with ‘Māui the Loved’ an introductory solo danced to the track ‘Tuhia’ from Link’s 2017 album ‘Kia Kaha’. 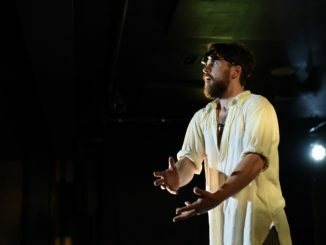 The piece explores the ‘man’ behind the Māui legend, exploring the vulnerability of a child who was believed to have been still-born and given a sea-burial. As the dancer moves it often seems like his heart is literally soaring and the choreography includes a series of recurring actions with the dancer reaching to pull his ‘soaring heart’ back into his chest. In the next sequence ‘Māui the Resilient’ we see Māui being rescued from the sea with the cast assembled on the stage recreating the lapping waves of the ocean with their bodies, and the dancer’s body carried into the space where he is slowly revived. The sequence ‘Māui the Joyful’ includes aspects of traditional Samoan dance, performed to the joyful reggae track ‘Don’t Wanna Fight It’ (Sa’ili Le Alofa) by Tomorrow People, and incorporating the synchronised quick hand gestures of Sasa and the percussive slaps of Fa’ataupati. The segment includes members of the Le Era Fou dance troupe who perform a single number in the production. 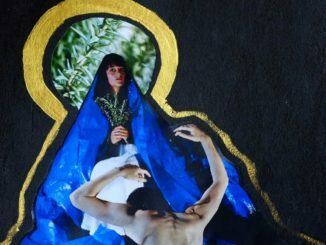 The sequence ‘Māui the Prophet’ explores the enduring spiritual connections to Pacific cosmology in the midst of an increasingly globalised and urbanised world. Here the visual images projected on the back wall begin with the time-lapse footage of nature that slowly segues into extended images of urban life. 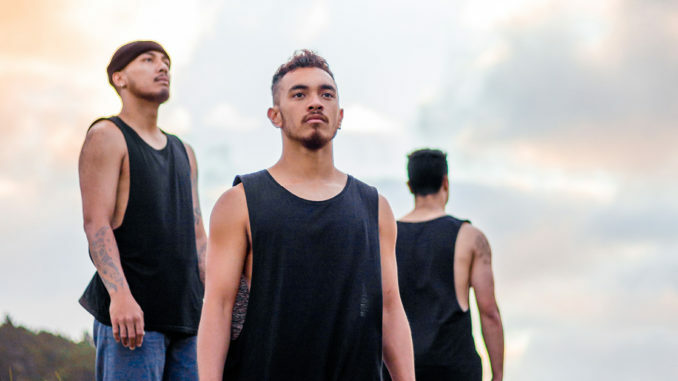 The sequence includes the voice of the narrator reading the poem ‘Urban iwi: Tihei mauri ora’ by Samuel Cruickshank as four dancers walk between four spots on the stage before launching into a hip-hop choreographed movement piece. ‘Māui the Powerful’ includes a wonderful haka that retells how fire was stolen from Mahuika – the Māori fire deity. In this sequence the elevated stage became a large drum, with the stomping of the dancers literally shaking the walls and seating banks of the Town Hall. The final chapter of the story – ‘Māui the defeated’ – explores Maui’s search for immortality and ultimate defeat, with the production returning to the opening visual motif and ending with the body of the demigod and legend being carried back onstage. ‘Maūi’ was an engaging feat of direction and vision. Boasting a cast of around 26 members, this was a feat of commitment and dedication. Not only were the dancers talented, energetic and graceful, but they brought an exuberance and joy to their performances that was palpable and refreshing. This is a wonderful production that merges the old and the new, offering a dance experience that contains rhythm, narrative, joy and humour. It also transformed the environment at the Town Hall, helping to democratise the concert chamber by inviting in and including a culturally diverse production and audience. This has been an important feature of Auckland Live’s contribution to the Fringe which seems to be leading efforts to make Auckland venues more accessible and inclusive. Māui was presented by Fresh Movement and Auckland Live as part of Auckland Fringe. Concert Chamber, Auckland Town Hall, 23 February.